Mega Steinway, Virtual Acoustic Piano from Sound Magic. Sound Magic keeps on developing their Neo Hybrid modeling/sampling technology and applies it to a new Steinway piano plug-in. Mega Steinway uses the DFD (Direct From Disk)/RAM hybrid system, thanks to which the Neo Piano Engine analyzes the MIDI performance to determine the optimum balance between hard drive and RAM sample access. The sound collection is enriched with functionality, among them a resonance engine based on multi-angle impulse responses that are then converted into algorithms, a Style Designer that allows for adjusting the pianos according to your music style (pop, jazz, classical, rock…), Artificial Intelligence tools that check the keyboard and pedal response, the Scala Tuning System with 4,000 available tunings and you can choose between multiple GUIs to suit your needs. 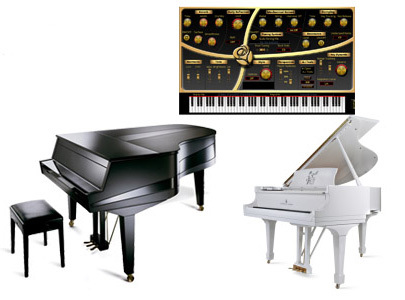 The Mega Steinway is a VST and AU 32 and 64-bit as well as AAX 64-bit plug-in for Mac OS X and Windows. It is available for $399 and you can listen to demos at www.supremepiano.com. The Allen & Heath Qu-You app on Android Allen & Heath has released on Google Play the Android version of the Qu-You personal monitor mix app for the Qu series of consoles. Bitwig 8-Track ships with Livid controllers Bitwig keeps on developing partnerships with MIDI controller manufacturer and is announcing that Livid Instruments has joined their program. A review of the EastWest Composer Cloud subscription service Subscription-based plans are becoming more common for music software. While presumably a good thing for the developers, they’re not necessarily so great for users, who have to pay over and over for a license, and can lose access to the software if they let the subscription lapse, or if the developer goes belly up. That said, one subscription plan that I think might actually be a boon for musicians is EastWest’s Composer Cloud, which gives users access to a large selection of EastWest products without having to buy them.